The success formula for punk bands usually requires years of making loud, angry noise in basements before the angst catches on. Moss Lime, a Montreal post-punk group, is almost the opposite of this boys-in-the-basement stereotype. Frontwomen Hélène Barbier and Caitlin Pinder-Doede only started teaching themselves their respective instruments this past year, and didn’t even plan to form a band when they started playing together, finding themselves surprised to even have been labeled as punk. But since they started writing songs together in the summer, the group has been gaining buzz and playing shows around Montreal. Just last week, they released their debut EP, July First. On a rainy day in the Mile End, Barbier and Pinder-Doede took the time out of their performance schedule to chat with The Daily about July First and the band’s experience as an emerging post-punk group in Montreal. Having just played two shows this past week, with an additional one scheduled for this coming Monday, the girls were rather worn out; regardless, they were eager to chat, maintaining a calm and positive outlook as they discussed the drastic changes and new developments of the past few months. 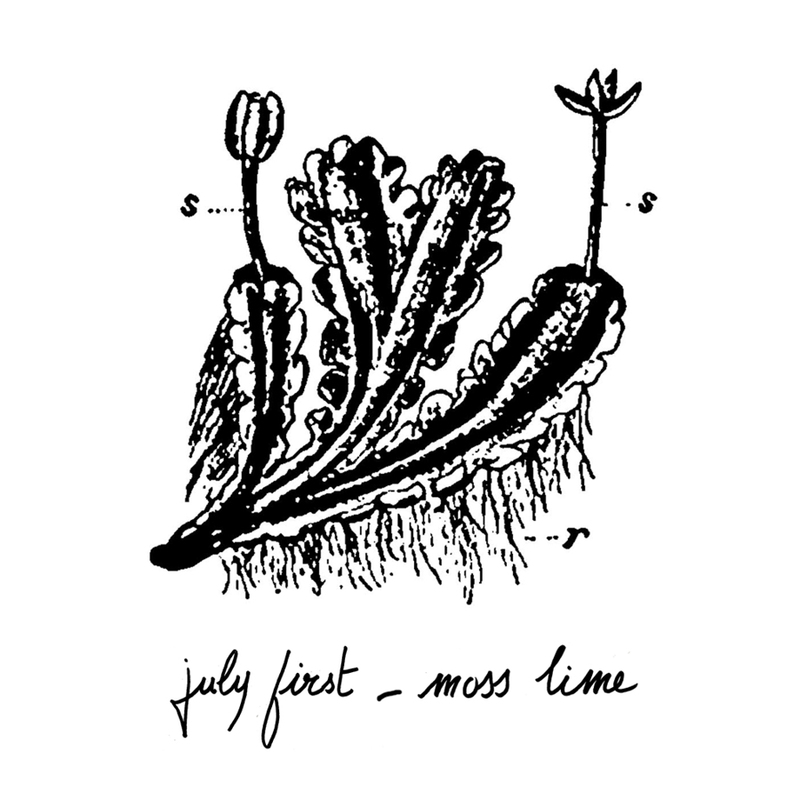 MD: How did Moss Lime come into existence? CPD: Hélène and I were roommates a few years ago, and I think we had talked for a while about wanting to do something, but we were kind of shy and never really managed to do anything. I came back [to Montreal] this summer and we were playing around a bit with basses. We never really intended to be a band; we just wanted to try out a show in August. So our goal became to get songs to play [for] that show and then after that we were like, we should record them just to have a souvenir! MD: What has it been like starting out as a band in Montreal? CPD: It’s been really great. People have been so supportive. […] Fixture Records has been great too. They’re the best. We didn’t know what to expect, really, but they’ve done way more than we thought was going to be done. MD: Fans and critics have been referring to your sound as “minimalist post-punk.” What does it mean to be a post-punk band in Montreal today? How would you describe your music? HB: We were surprised to hear this. It was funny, because we were really aiming for something more surf rock. We really wanted to do something summery. MD: So you didn’t really intend to be post-punk? HB: No, no. I always wonder, what is post-punk, anyway? I would say it’s a nice definition for people who don’t know how to use pedal effects, reverb, whatever. As for “minimalist”— that’s really just in our inexperience. MD: Tell me about your inspirations. CPD: Definitely a lot of frustration. And rejection. MD: So I guess that plays a lot into your seemingly angsty lyricism. How do you go about writing songs? Where does a song like “Ice Cream Sandwiches” [from the July First EP] come from? CPD: Well, that was cool, actually, because there was this one night where we were [playing] and “July First” and “Ice Cream Sandwiches” were actually mixed up – the lyrics were intertwined, and it was bothering all of us. I think [Hélène] suggested for everyone to just write what they want, and to put it all together. So we ended up all having a piece in that song. Really, that’s what I like the most – we each try to throw in what we can. Especially when you’re stuck, and then someone throws something in. That’s my favourite feeling. MD: Cool. Well, even though you don’t [think of yourselves] as punk, you do kind of have this female-fronted, punky vibe going on. Do you have any thoughts on [women in punk], or feminism? HB: It’s really interesting that you ask this, because we have talked about this before, with a French paper. They asked as what the difference is between being in France and Quebec, and we answered that in France we’re a girl band, whereas here we can just be a new band. MD: For me, when I saw post-punk and female, I thought of [feminism] immediately. HB: I think we’ve been processing this [punk feminism] more since watching that documentary about Kathleen Hanna [lead singer of Le Tigre and part of the punk-feminist movement of the nineties]. CPD: Maybe subconsciously that has been influencing us. HB: Well, I watched it like four times this summer. MD: Inspiration wise, are there any other movies or artists that have been inspiring you guys? CPD: Also, we were listening to a lot of Freelove Fenner together, and CROSSS, and Each Other … La Femme … ScHoolboy Q. And Beyoncé. MB: Considering the visa troubles you’ve been facing, what are some of your goals as a group from here on out? Are you planning to go on tour? Can we expect some new music any time soon? CPD: We’re in the midst of figuring everything out. I think our goal is to ultimately tour next summer. MD: What’s the story behind both of these new tracks? “Dreamboat” is a love song […] just really cheesy rejection. Trying not to be tacky about it. Trying to be a bit fun. Moss Lime is playing Monday, November 10 at Brasserie Beaubien Ltée.